An Assegai round being fired from a Denel T5-52. Rheinmetall Denel Munition (RDM) has concluded its third ammunition capability demonstration, which saw 800 attendees congregate at the Denel Overberg Test Range to witness all manner of ammunition being fired, from hand grenades to artillery. 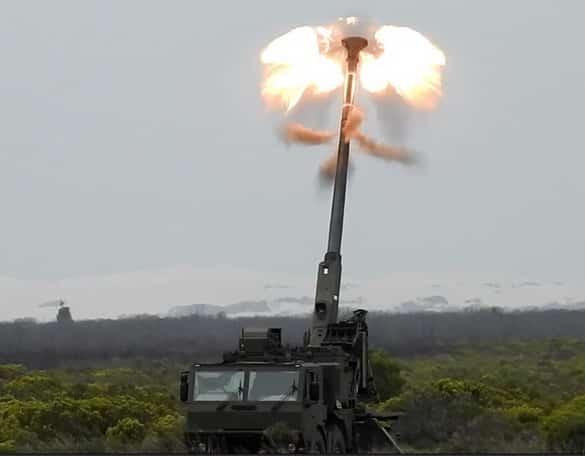 The 2019 Ammunition Capability Demonstration (ACD) took place at the Denel Overberg Test Range outside Arniston in the Western Cape between 18 and 21 March, and was notable in that the South African National Defence Force (SANDF) provided substantial support to the event. Many vehicles that were driven down to Cape Town for Armed Forces Day on 21 February were kept in the Western Cape for the ACD, which was attended by Chief of the SA Army Lieutenant General Lindile Yam. Yam said it was the third time that the demonstration was held but the first time it was held integrally with the SANDF. He said it is important to partner with the industry as soldiers are the ones who use its products and test them in real world environments. The explosive part of the demonstration began on the evening of 19 March when Hawk and Gripen jets dropped bombs and fired cannon rounds at targets on the range. Individual weapons, ranging from assault rifles to multiple grenade launchers, were fired before the larger weapons were demonstrated, including mortars, anti-aircraft artillery and 76 mm naval guns. Ratel 90s and Olifant main battle tanks fired their 90 mm and 105 mm weapons while the Denel Land Systems T5-52 self-propelled artillery system fired RDM’s Assegai range of 155 mm ammunition. The Rooivalk attack helicopter also engaged targets, as did a Lynx with a cabin-mounted machinegun. As the demonstration was carried out in the evening, RDM mainly demonstrated ammunition that could be seen clearly at night, such as flares (including those launched from the Rooivalk and Hawk), smoke grenades, anti-aircraft artillery (23 and 35 mm) and rockets (both 127 mm Bateleur and 107 mm rockets were fired). The proceedings culminated in a mass shoot under the light of dozens of flares that lit up the night sky, and ended in a wall of fire. The following day showcased RDM’s ammunition, including grenades (hand and 40 mm), flares, mortars, 76 mm guns, artillery and the Plofadder mine clearance system. The company’s new 40 mm medium velocity airburst ammunition was a highlight, as was the Rheinmetall Canada Mission Master unmanned ground vehicle firing a salvo of 14 Thales 70 mm rockets delivering 60 kg of explosives in 1.6 seconds – the vehicle has been at Overberg for the last month for firing trials and recently received NATO and SANDF qualifications. The Mission Master has two launchers for seven rockets each mounted on an adapted Rheinmetall remote weapons station. Also on the vehicle side, Rheinmetall demonstrated one of its trucks as it is pushing to meet the SANDF’s Africa Truck requirements for a new logistics vehicle. A Request for Information to this effect was published in December 2018. The South African Air Force had a big presence at the demonstration, with Gripen and Hawk jets joining Rooivalk and Lynx helicopters on the range. An Oryx helicopter flew in a Special Forces sniper team and carried out a simulated aero medical evacuation. A mock battle was then staged involving mounted and dismounted infantry, Olifant main battle tanks, Ratels and Rooikat armoured cars, backed up by cannons, artillery and rockets. The Special Forces played a big role in the demonstration, showcasing their weapons and Hornet vehicles. The engineers also had their time to shine, detonating ditch-creating charges and ‘water spout’ charges. Denel Dynamics products were fired including the dual pulse rocket motor for the Umkhonto Extended Range surface-to-air missile. This gives a range of 30 km. Unfortunately two Ingwe anti-tank missiles launched from a Ratel vehicle both failed for reasons as yet unknown. Denel joint venture Barij Dynamics (previously Tawazun Dynamics) showcased its Sajeel bomb guidance kit, with one of the weapons launched from a Hawk. It successfully impacted the ground several metres from the target after being dropped from 35 000 feet and flying through clouds. The weapon can be either GPS/Glonass guided or combine GNSS and laser guidance. The kits can be fitted to the Mk 81 or Mk 82 bombs and complement the company’s Al Tariq guided bomb kits. RDM used the ACD to not only showcase its existing product range but also to unveil new developments, including additions to its Assegai 155 mm artillery range and two new 40 mm medium velocity rounds: automatic self-destruct and air burst. The air burst rounds can be programmed to detonate next to a target and are programmed in conjunction with a laser rangefinder. Another recent addition is RDM’s range of hand grenades, which were also demonstrated. These will be fully qualified by year-end. RDM used the ammunition capability demonstration to share production information during seminars, which covered its unmanned aerial vehicle (UAV) defence systems, Mission Master unmanned ground vehicle, and air defence solutions. RDM CEO Norbert Schulze said the ACD is a very important showcase of the company’s capabilities, with highlights including extended range 81 mm mortars (8 km range), long-range Assegai 155 mm rounds (70 km range), the new hand grenade range and new 40 mm medium velocity rounds (there are now nine different rounds available). He added that development of the Cheetah counter-rocket, artillery and missile (C-RAM) missile is progressing well and promises to be a unique solution with a patented warhead. “The support of the SANDF was extraordinary. We couldn’t have delivered this show without them and the support of the Overberg Test Range,” Schulze said. They helped showcase ammunition and vehicles to visitors from 53 different countries, including existing and potential clients. Rheinmetall Denel Munition specialises in the field of ammunition, including design, development and manufacturing, particularly regarding artillery, mortar and infantry systems as well as plant engineering. While Rheinmetall Defence does most of its business with NATO countries, Rheinmetall Denel Munition covers not only the South African market but also Asia, the Middle East and Latin America. 85% of its production is exported. The next capability demonstration is due to be held in 2023.